An 11-year-old Antigo area boy who is continuing his own battle against a high-risk form of Leukemia is now looking to give back, not only to the community which has supported him, but to other children dealing with a similar diagnosis. Unite and Fight Community Breakfast and Run/Walk. and to children currently battling cancer. 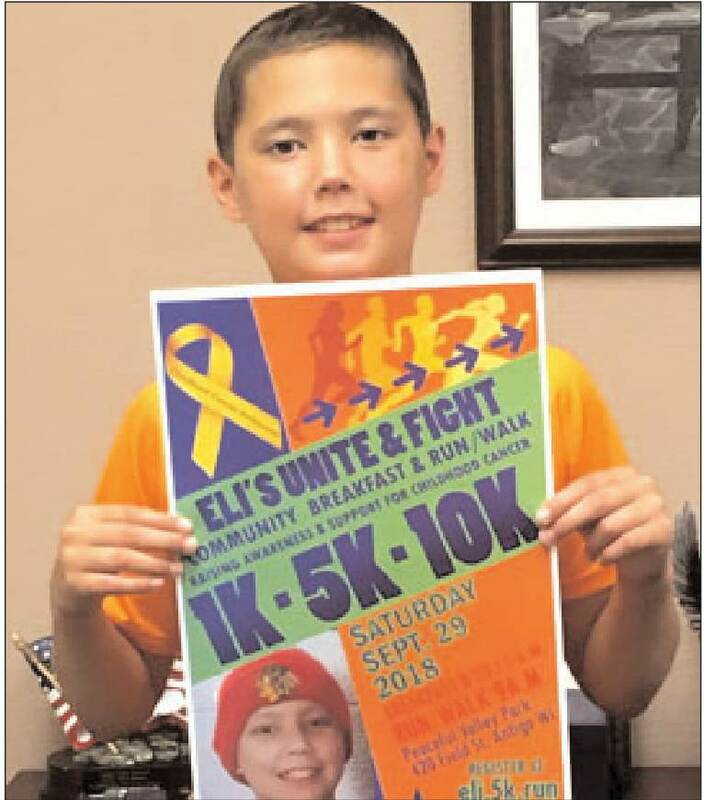 Eli Kassler, and bELIeve15, a group made up of Eli and his supporters, will put on Eli’s Unite and Fight Community Breakfast and Run/Walk on Saturday, Sept. 29 in Antigo’s Peaceful Valley Park area. The bELIeve 15 moniker is a nod to Eli’s hockey number, as he is an avid player and even recently returned to the ice. The purpose of the event is to raise awareness and support for childhood cancer..
“We just wanted to do something for kids with cancer and then my aunt came up with the idea,” Kassler said. The breakfast will be served at St. John Catholic Church from 8-11 a.m., with the run/walk beginning at 9 a.m. Proceeds from the run/walk will benefit the MACC Fund (Midwest Athletes Against Childhood Cancer), while funds raised by the breakfast will be used to purchase gifts for other children currently hospitalized and receiving treatment. A blood drive and Be The Match, an bone marrow donor match program will also be on hand. Kassler was diagnosed in the fall of 2017, and although he has now entered the maintenance phase of treatment, he will have to continue with oral, spinal, and IV chemotherapy for another nearly two years. Following early treatment, Eli’s mother Corrie began to extensively research the disease and the statistics she found on childhood cancer and the funding for its research and treatment were startling. Cancer is the number one killer of children in the United States and claims more lives than all other child diseases combined, and a child is diagnosed with cancer every two minutes. Despite those figures, only four percent of government funding for research goes to all childhood cancers combined. Further, only three drugs have been specifically approved and less than 10 developed for use in cancer treatment in children since 1980. In 95 percent of those who win the fight, they suffer from other life-long side effects from the cancer or treatment. Acute lymphoblastic leukemia, which Kassler was diagnosed with, is the most common type of childhood cancer. The costs for families is astronomical, with the average cost of a hospital stay at $40,000 each time. The MACC Fund supports research that helps children fight cancers and blood disorders. It has contributed more than $50 million in an effort to improve survivorship rates and the quality of life, while trying to find a cure for childhood cancer and other related blood disorders. Costs are minimized by using limited overhead staff and volunteers, with 90 percent of donations going directly to research. Funds can even be earmarked to a specific type of cancer research. The Run/Walk features three separate distances, including a 1K, 5K, and 10K. Those wanting to participate can register at eli.5k.run, but can also sign up the day of the event. Runners are encouraged to get pledges for their efforts and can run or walk in teams. There will be even be prizes for costumes. Raffle baskets will be available at the breakfast, with the Knights of Columbus on hand to help serve up pancakes as well. A number of individuals and area businesses have also lent their support to the event, from sponsorships to volunteers and organizers. In the end, the amount raised and knowledge gained will be worth all the hours of planning and work. Source: Antigo Daily Journal, September 22, 2018 edition.